We are proud to say that our curtain tracks can be used in every room of the house. They can dress windows, replace doors, and create virtual walls. They can even liven up the most mundane of jobs: hanging a shower curtain. We know, in the bathroom our shower curtain tracks are competing for your affection with both rods and shower doors, but hear us out. Using curtain tracks in the smallest room in the house can make a big difference in function and style. A ceiling-mounted shower curtain track gives you the flexibility to put the track where you want it, and allows you to think outside of a straight line. In fact, there are situations in which an oval or circular-shaped track is necessary to adequately cover a corner shower, claw foot tub, or garden bath tub. A rod or door is not going to help you in these situations, or any time you have a small space to work in. Our 6100 Flexible Curtain Track is particularly good in tight spaces, and is easy to bend by hand as needed. 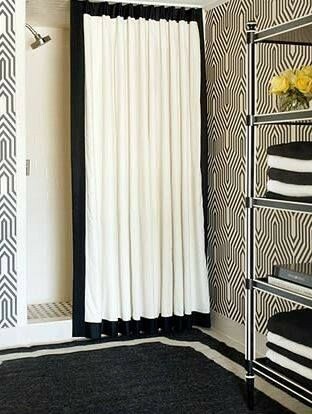 Shower curtain tracks are practical, but can be fashionable as well. They allow your curtains to take a prominent, unique, design role, or slide out of view and fade into the background as you like. If you want to let off some steam, or just create a cool, retro look, you can hang your curtains from stylish beaded chain drops. This will allow you to hang a standard shower curtain, but you don’t have to. Invest in an Aquaguard Vinyl curtain liner, and your outside curtain will be completely protected from spray, which means you can hang a decorative curtain of any fabric, not just one made for showers. We would love to get some pictures from some do-it-yourselfers who have installed curtain tracks in their bathroom. Is that you? Email us at info@curtaintracks.com.